Is accurate, easy gold testing an important part of your business? What if you could get the utmost in accuracy with only a few seconds of testing? Contact Bruker today to find out how our handheld XRF gold testers can help you achieve the utmost in accuracy and sample throughput. Handheld gold tester means you can test gold samples and gold alloys anywhere, anytime, from the scrap pile to the refinery floor. Bring the lab to the sample! 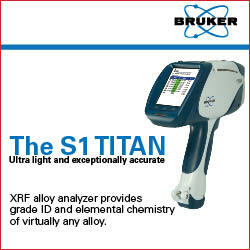 The S1 TITAN offers the utmost in accuracy combined with the ultimate speed, with assay-level results achievable in a matter of seconds. Easy to use gold testers require only minimal training to operate with confidence and ease. Complete alloy chemistry for all elements including gold, down to the ppm level. Results are saved automatically and reports are easy to generate using software provided for the simplest reporting and traceability. Optional hardware including an onboard camera and beam collimator for small area analysis offers additional benefits such as the ability to save an image of the exact sample spot with the analysis results and to narrow the analysis area to a small detail such as one specific feature on a printed circuit board. Bruker S1 TITAN gold testers can ensure that any gold sample meets spec, gets correctly sorted for recycling, or whatever your particular gold testing challenge may be. Contact Bruker today to talk to our knowledgeable staff regarding your specific gold testing needs.